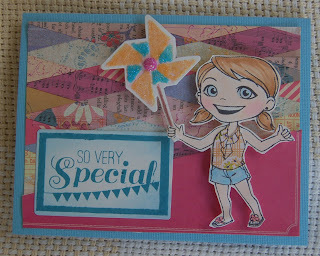 I used the Sizzix rubber stamp and die set (from Ben Franklin Crafts) with the pinwheel. With a little WOW glitter (also from BFC)and a glittered candy dot, the card got a boost of sparkle. 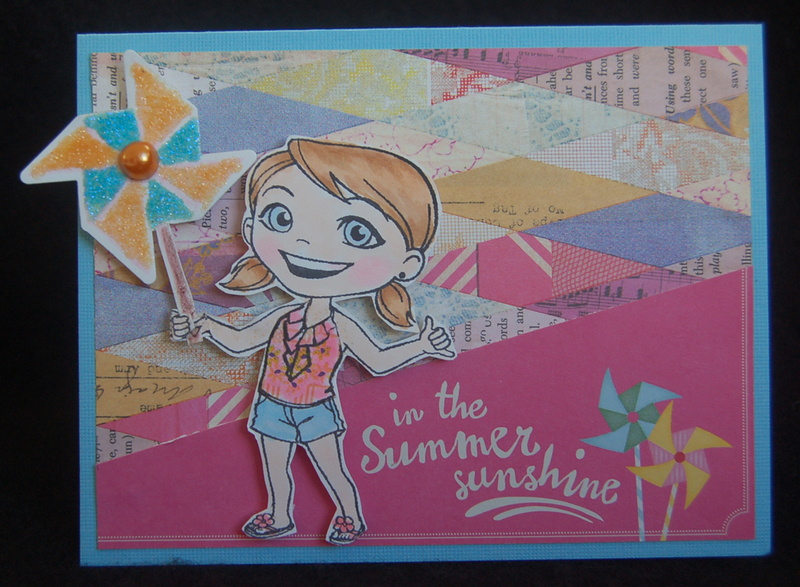 Because I had extra paper and time, I made a second card and used the 'so very Special' stamp that came in the Sizzix set rather than cutting up another sheet from the Mayberry pack. Oh, to make Yumi's hand look like it is holding the pinwheel, I cut the fingers off of Fumi's 'shaka' hand (sorry Fumi) and glued it over the pinwheel stick. 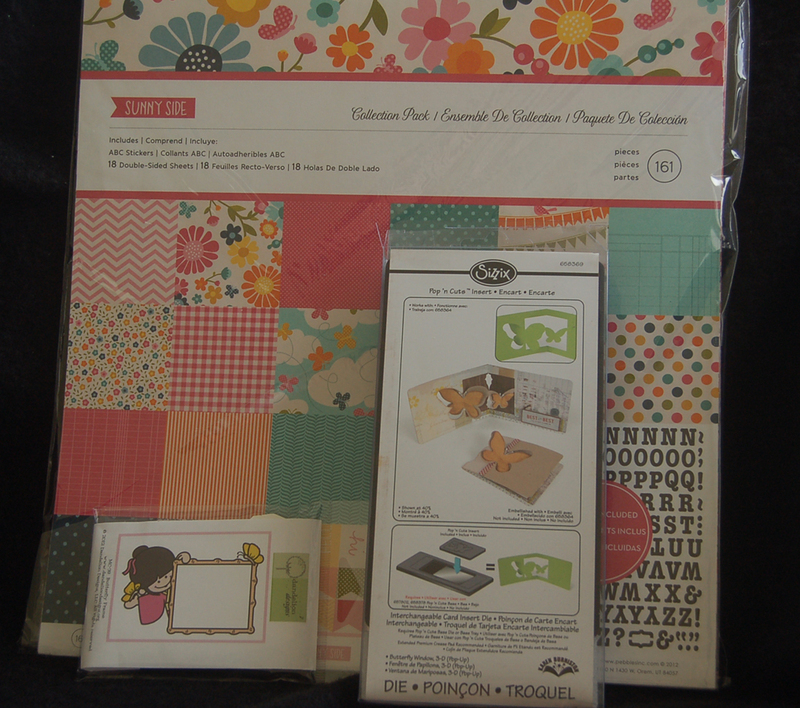 The printed quilt-like paper came from a Hero Arts 6x6 pack called Soleil. Fumi and the pinwheel are raised up on pop-dots and Fumi's blouse was paper pieced. I still have lots of stamps that have not ever been inked up, so I hope you will return to see more of my projects. I'm slow but eventually I will use them all, really LOL! Ahhh, Halloween's coming up....time to make something spooky! 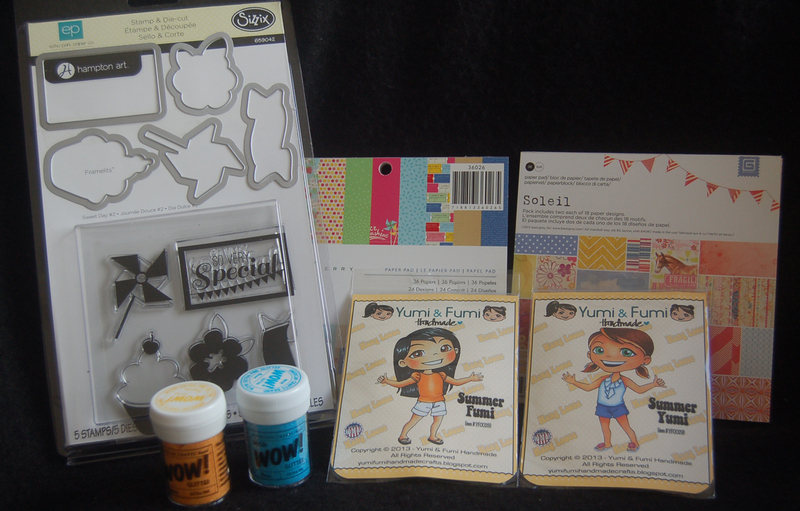 Have you heard about My Locker, the latest place for crafters to sell their work? 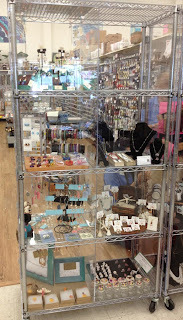 Ben Franklin Crafts has recently installed clear acrylic lockers for crafters to rent. In these lockers crafters can display and sell their work. 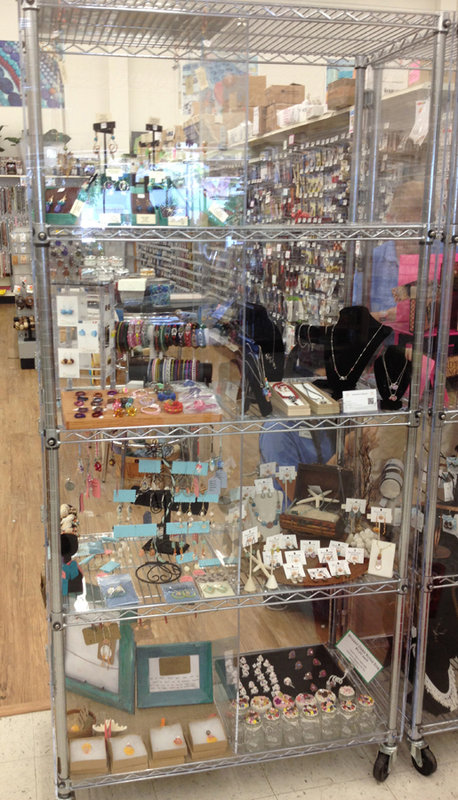 Shown in the photo above are just eight of the spaces rented by local crafters. Rent for locker space is determined by the location on the rack (lowest lockers are cheaper than those at eye level). Here is a photo of a locker renter who did an attractive display of his/her work. Most of the items were ocean themed so the space was cleverly decorated with a treasure chest, starfish, etc. All the items were priced and the locker was not over-crowded. 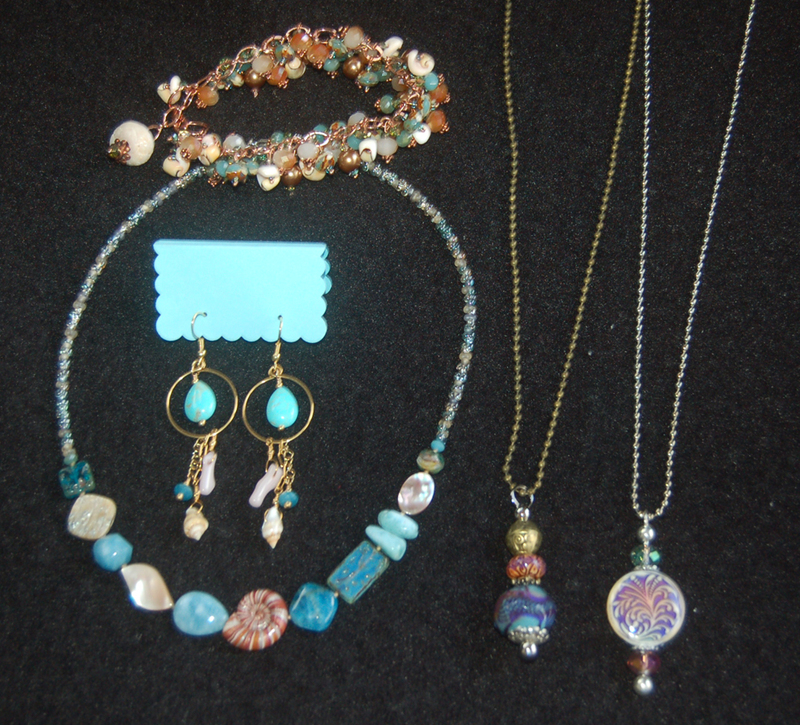 These are some of the jewelry pieces that I purchased from the lockers at Mapunapuna BFC. Even though I make jewelry, I was impressed by the great craftsmanship and reasonable prices. 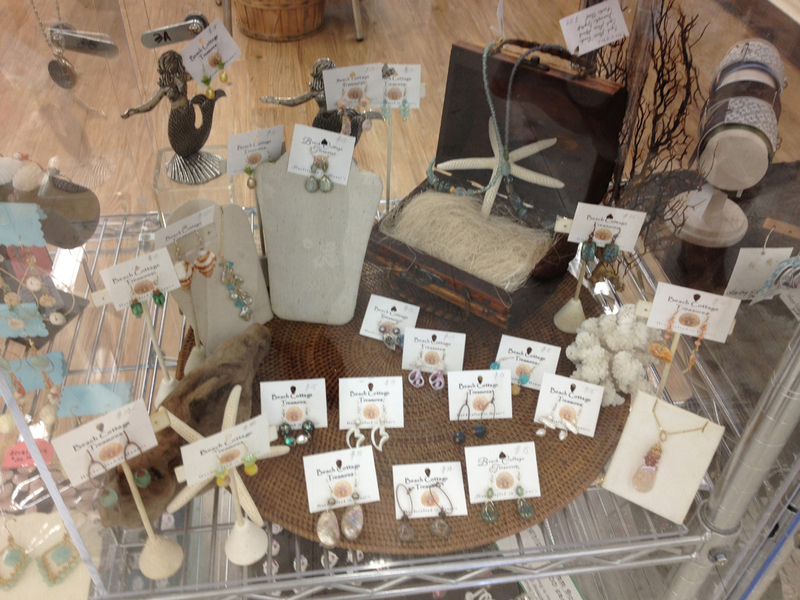 The earrings were made by employee, Lynn Hashino, and the necklace around it was from the ocean-themed locker (sorry I don't know the crafter's name). If you like mood jewelry, you might be interested in the color-changing necklaces that I bought (the two on the right). From the Market City lockers I found a lovely ceramic cup and some drilled shells (no photo). Not all the Ben Franklin Craft stores have lockers yet, but please keep checking if you are interested in buying or selling crafts. It's not too early to shop for Christmas gifts and I think you will be very pleased by the handcrafted items you will find in the lockers at Ben Franklin Crafts. One of my 'old lady' girlfriends is having a birthday in a few days. As usual, I procrastinated and today I had to rush to finish a special card just for her. 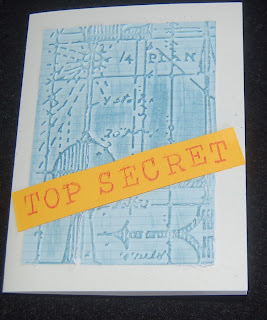 She is an engineer with a good sense of humor so I started the card with an embossed image (Tim Holtz Sizzix) on a blue lined cardstock from a 6x6 pack by American Crafts. 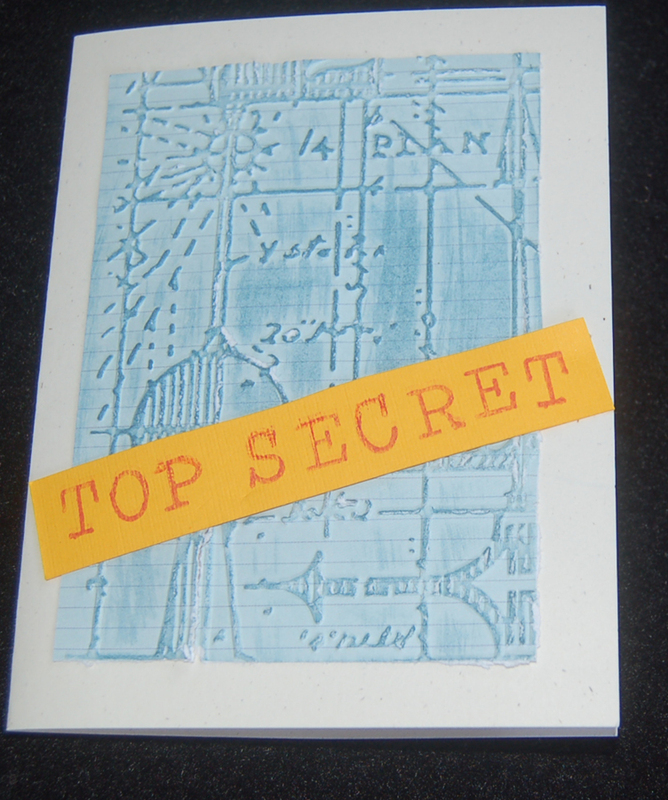 The 'Top Secret' was hand stamped with letters from a Hero Arts letter set. For the humor part I used an Ai stamp image of an exhausted old lady who looks like she just collapsed after putting up the banner (Clear Hero Arts stamp set). The tired lady is me and is typical of my energy level compared to my girlfriend who seems to be always on the go. For me, one craft project seems to take all my effort and brain power. LOL! 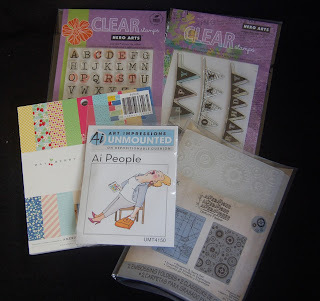 Except for the Ai stamp, all the supplies came from Ben Franklin Crafts. 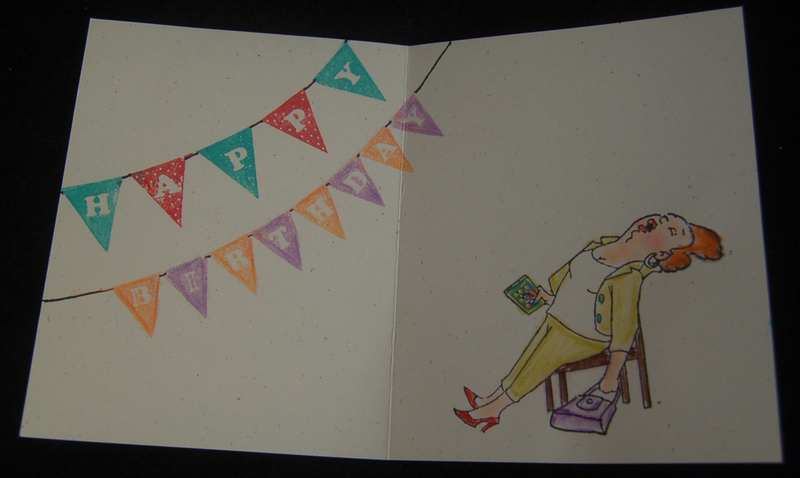 I am proud that I made a quicky card that expresses my humor and attitude about birthdays in my old age. You are never too old to celebrate a birthday......and remember, "Birthday calories don't count!" Thanks for stopping by today. Please leave a comment if you have some time. I enjoy your feedback. 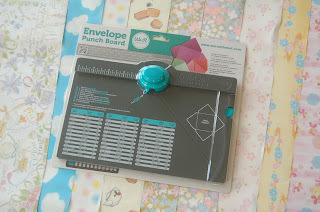 Over the years I've purchased many envelope makers (mostly templates), but they were just simple trace and cut tools and could only do a few sizes. This new tool available at Ben Franklin Crafts is a delight for crafters who want to make special envelopes for their card creations. The envelope punch board can create many, many different sizes of envelopes. It is simple to operate even for a non-mechanical person like me. I have found that the large sheets of wrapping paper sold at Celebrations (next door to BFC Mapunapuna) are perfect and economical for envelope making. 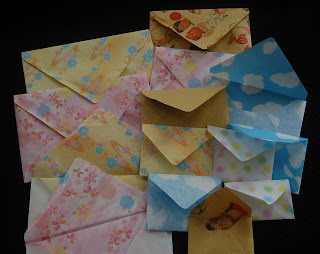 Here are a few samples of envelopes I made in just a few minutes. If the bottom flap protruded up too much, I cut the tip off with a scissors. Sometimes I reversed the paper if the front side was too busy or slick so that names and addresses could be written without using a mailing label. 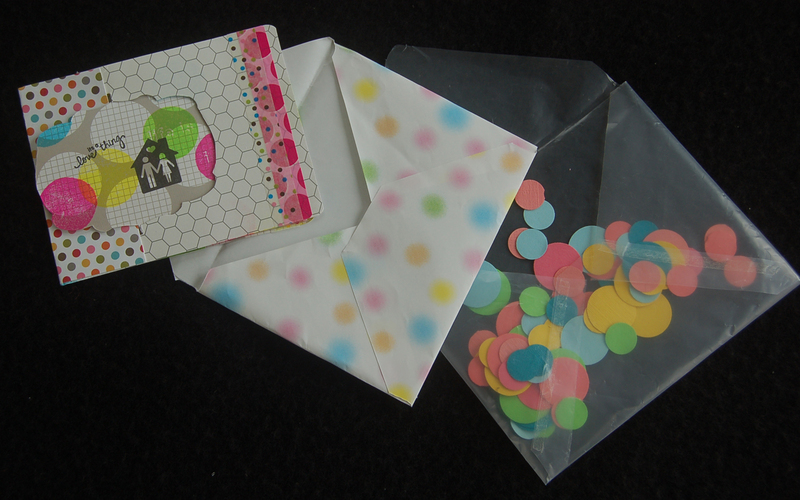 Between the two envelopes, I enclosed some dots punched out from my scrap pile. I think the moving inner dots make a delightful surprise. Just think of all the possibilities! An extra long ruler, cutting mat and rotary blade are useful to use with the envelope punch board. To form the envelope, double stick (Merikan) tape is my choice. The envelope glue is a product from BFC which helps make your envelopes more professional (especially if you are making gift sets) because once dry on the flap, it can be moistened later to seal the envelope. I hope that if you are a card maker you will try this new envelope maker. You will be able to make clever envelopes by recycling calendar pages. magazines, shopping bags, etc. 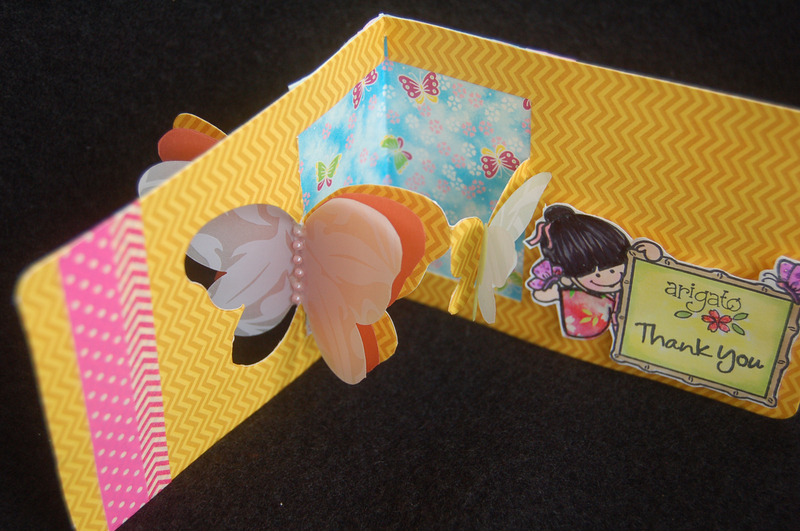 Also you will be able to make an envelope to fit any size card that you create. I love this new tool and I feel certain that you will too! I'm kind of obsessed with the Sizzix 3D Pop-Up window dies. 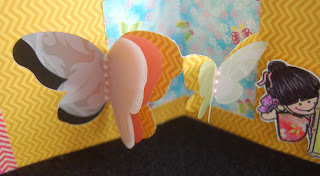 I purchased this butterfly one from Ben Franklin Crafts and couldn't wait to roll it through my machine. (You'll also need the card base die to make this card.) Probably the most important and hardest part of this project is to choose the right double-sided printed card stock because both sides will show. 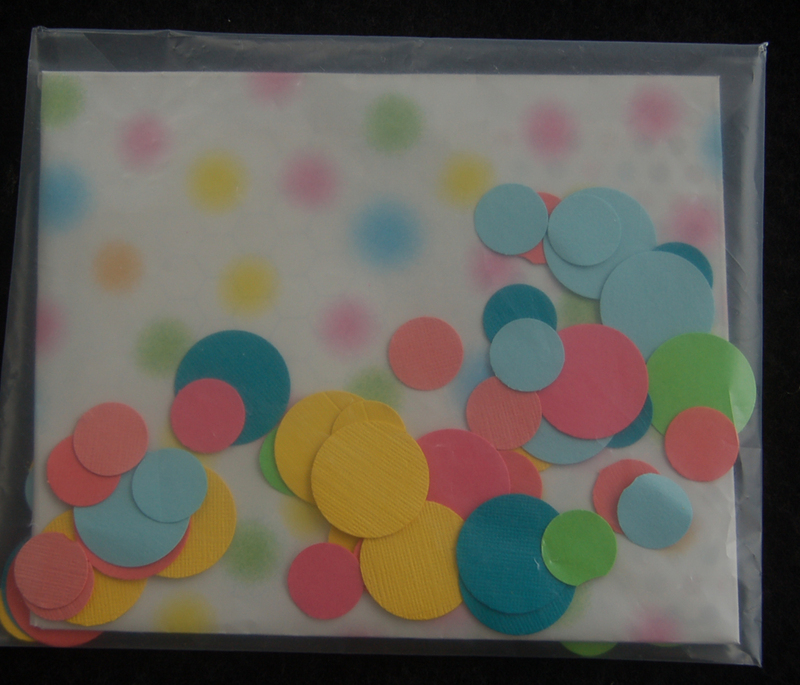 My card stock came from a Pebbles pack called Sunny Side. 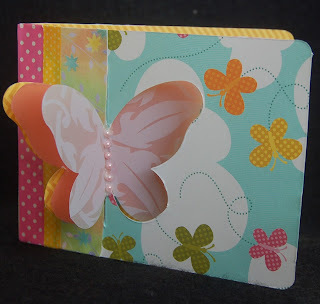 I used the same butterfly die to cut the sheets of colored vellum and printed vellum to make the extra butterfly wings. I added the pearls for embellishment but also added extra glue (Fabri-Tac) to the ends of the pearl strand to strengthen the joints of the bigger butterfly. (I think I opened and shut the card too much LOL!) A Dandelion Design stamp was used to make the sign which was stamped with the message. 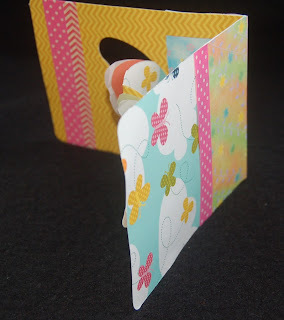 To cover up the opening at the seam of the card, I cut a rectangle from two sheets of origami paper and taped them together and onto the the card base. Washi tape from BFC was added to the card to add color and tie the inside and outside of the card together. I'm pleased with the outcome of this card and hope that it will please the recipient who recently gifted me with a terrific seasoning mix. 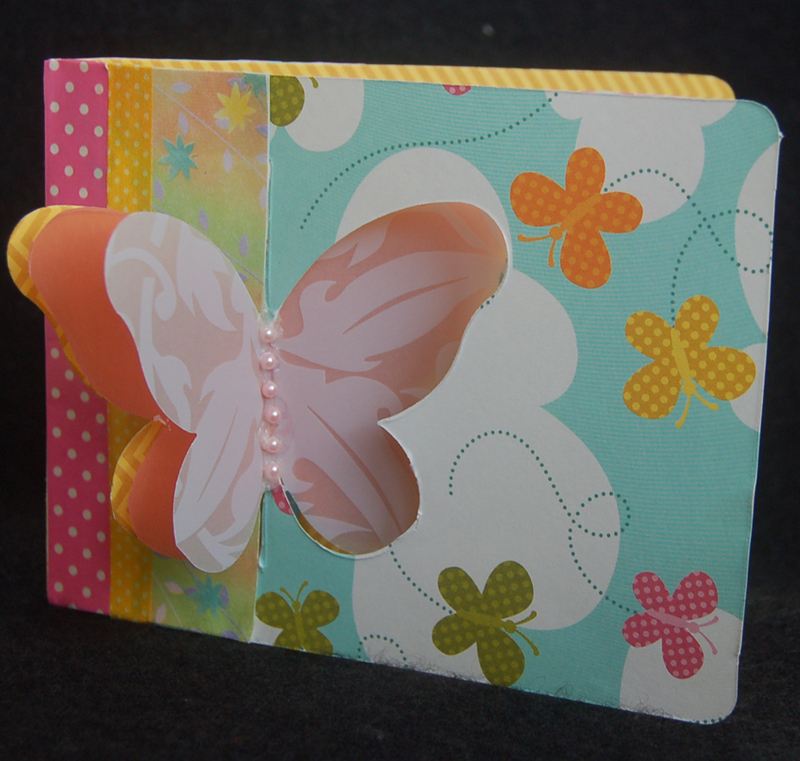 I know that I will use this Butterfly window 3D pop-out die often in the future because it is so adaptable to many occasions. In fact, I already have an idea for a sweet birthday card for someone who loves butterfly images. Maybe it's YOU! Guess what Jayne and Yvonne? You are the winners of my July's comments lucky drawing. 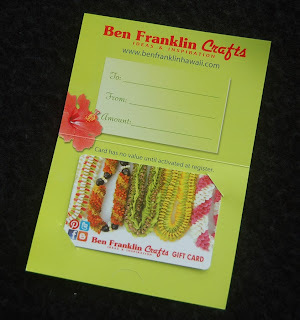 Just by submitting a comment in July you were eligible to become a winner of a gift card to Ben Franklin Crafts in Hawaii. 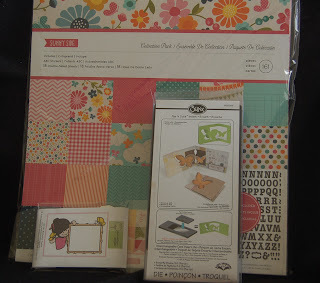 Since Yvonne lives in Singapore and probably cannot use the gift card, I decided to send her lots of neat craft products and draw another name to receive the gift card. The gift card has been awarded to Jayne. (I hope you live in Hawaii so you can use the gift card.) Congratulations winners! I will be contacting you via your email as shown on your blog site. 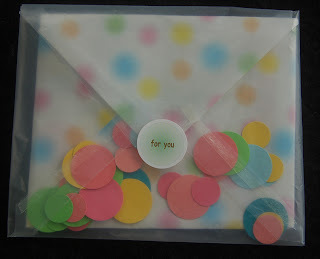 I will need your mailing address to send you your prizes. How can you win a gift card/prizes from Lynn's Craft Blog and Ben Franklin Crafts Club? By simply leaving a comment on any of my posts you will be entered to win. Every comment in a selected month is entered as one entry. The more comments you leave, the more chances you have to win. The month of the contest has no rhyme or reason; it's just directed by my whim. I hope YOU'LL be the next comment winner! 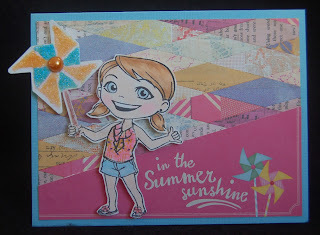 I paired it with some stamped images from a set of The Greeting Card Farm stamps called, Me Time Anya. All the images came from this set, even the little slippers and candles. The flowered paper came from my scrap pile and I chose it because it was flocked and reminded me of a bath towel or perhaps the tub stickers that keep you from slipping. Anyway, I was thrilled by the way this card came together so effortlessly. 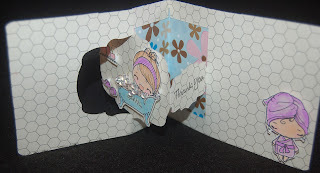 I think the last touch of Stickles and clear acrylic bubbles is what made the card come to life. What made me happiest is that the thank you note is well suited for the gift given. Hopefully, it will convey my gratitude. Thanks for stopping by. Please leave a comment if you have the time. I love hearing from you.